Our professional-grade hydraulic hoses and fittings can be assembled in our workshop to your precise specifications. In order to ensure we have your hydraulic hose, please refer to our directions below. Our company supplies and makes Gates® hoses/fittings only. STEP 1 - Once you have found the hose that is leaking, you should place a pan or cloth below the hose to keep hydraulic fluid from leaking onto the ground. STEP 2 - You want to carefully loosen each end of the hose. If you do this to quickly, you could cause a high pressure flow of fluid, which could cause death or serious injury. STEP 3 - After you have removed the hose, look for the hose I.D. or hose size such as 1/2". The size should be in inches or other specified manner. STEP 4 - Now, that you have your hose specified, you need to identify your fittings on each end of the hose. 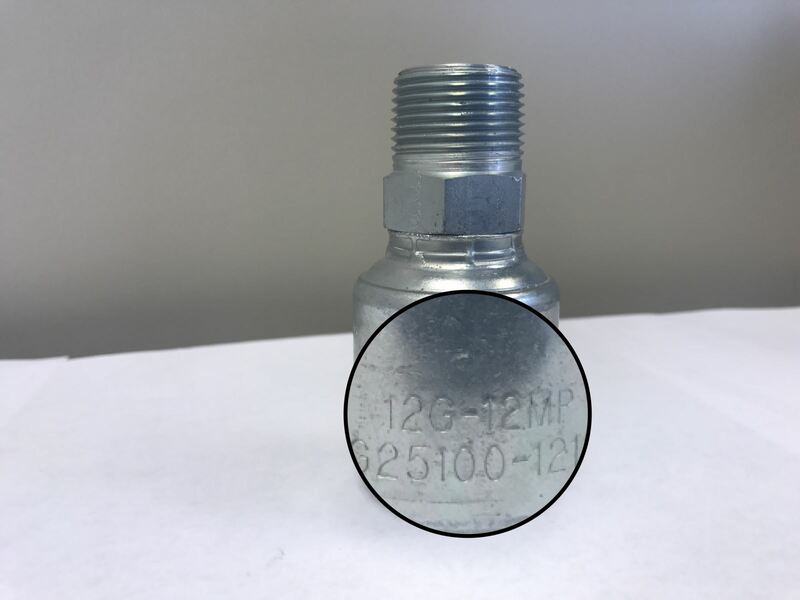 These are most commonly seen as a code such as 12G-12MP or other type of code. Look closely, because they are usually lightly engraved in the fitting.